During British Pie Week you may have noticed I ate a few pies, in fact, I ate pie for every meal and hence it has taken me a few months to catch up with all the reviews. Part of the challenge was to not put on any weight and so it occurred to me to try a vegetarian pie option as it was likely to have lower calories. We are not adverse to a meat free pie on the Pierate Ship, have a look at our list of vegetarian pie reviews. However, I was a bit worried as I had a bad experience before with the 'fake meat' quorn pie. This is a shame because I actually like quorn! 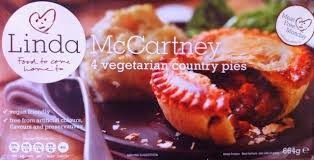 When I got a voucher for a box of four Linda McCartney pies in Morrisons I thought I should give it a go (normal price £2.50). This pie was eaten for breakfast on Day Seven of the challenge. See the video below for the review. Condition - 1 out of 7 - I realised that I made a mistake not cooking the first pie in the foil case but the others all exploded too (but less badly). Colour - 4 out of 7 - Not a bad colour, interesting idea to baste it before cooking. Cheapness - 3 out of 7 - Not a great price, it works out at just over 60p a pie, but they were very small at 166g each. Capacity - 3.5 out of 7 - For pies which were quite small, they had a good capacity, which was well filled and perhaps contributed to the exploding pies, but it was hard to tell for sure as the pies exploded. Chewiness - 3 out of 7 - Despite not having any meat in the pies were still slightly chewy. Content - 3 out of 7 - A decent beef and onion style taste but not as good as your average bakery. Consistency - 2 out of 7 - The pastry was too doughy, the product didn't hang together well, not something I would buy again. Overall not a great pie, it strikes me that if you want a decent vegetarian pie, avoid those that contain 'fake meat'. Polly put the pies in and we’ll all have tea! Reci-pie Review: Oh My Pecan Pie!